The day is finally here when Karan Johar will unveil the trailer of his next period drama, Kalank. After mesmerizing us with its teaser and wooing our hearts with its melodies, the makers finally decided to present us with its trailer and we bet it would be equally marvellous. Starring Alia Bhatt, Sonakshi Sinha, Madhuri Dixit, Aditya Roy Kapur, Varun Dhawan and Sanjay Dutt in lead roles, the film is set in the 1940s and revolves around the time of partition. As we wait for the film's trailer release, it's time to ogle at its amazingly gorgeous beauties. Kalank Trailer Review: Varun Dhawan and Alia Bhatt's Love Story Prevails Against The Horrors of the Partition Saga - Watch Video. 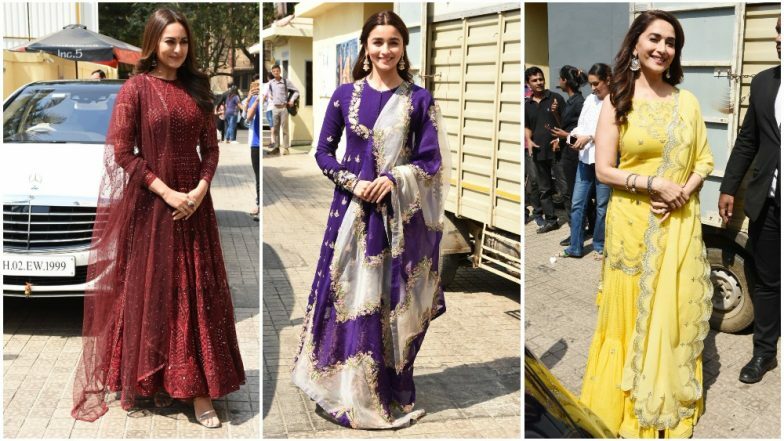 Sonakshi Sinha, Alia Bhatt and Madhuri Dixit are currently present at the film's trailer launch and they are shining like the brightest star in the sky. Ms Bhatt is looking radiant in her blue and white traditional outfit and we are so loving the colour palette. Coming to Sonakshi, she's looking elegant in her red embroidered dress paired with silver heels. And Madhuri is a ray of sunshine in her yellow ethnic ensemble. We are glad the ladies decided to stun in such beautiful silhouettes and make our hearts flutter with joy. Alia Bhatt-Varun Dhawan’s Kalank Is Inspired by the Book What the Body Remembers? A special note for the men of Kalank, who looked equally dashing in their traditional attires and made us go weak in our knees. But the day belonged to those charming faces who are looking equally desirable in the film's trailer.